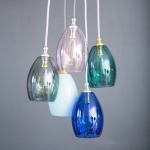 These Cluster Pendants are a collection of popular lighting models grouped together for a superb looking body of Glass Pendants. We can provide a bespoke service for these lights which gives you your own tailor-made cluster light. We can take any format of design for your Glass Cluster Pendant such as CAD drawings and Standard drawings or we can help you design your own light with the help of one of our lighting specialists. Feel free to contact us on 01748 821500 or sales@periodhousestore.co.uk and we will be happy to help to help you create your perfect light.